This hope and the firm conviction that the world is yet to happen – and that for Kafka was an spiritual image – is precisely what was translated from the language of passions and reactions into the language of deeds and actions during the Friday of Dignity in Yemen – March 18, 2011 – when pro-government forces broke a peaceful sit-in in the capital Sana’a, shooting dead over fifty protesters and injuring over a thousand. Friday of Dignity (Juma’at El-Karama) was the turning point in Yemen’s revolution. The entire nation was shocked and hundreds of thousands flocked to the streets all over Yemen and joined the protests – military defectors, members of parliament, southern separatists, Houthi rebels and the silent majority – demanding the end of Ali Abdullah Saleh’s 33-years-long rule, inspired by the example of Tunisia and Egypt. And there is no question today that the past was irretrievably shut off that day, in order to be replaced by a turbulent present in which the lines of hope laid out by Kafka – and by any revolutionary force – are nowhere to be seen. But an unhappy present does not interfere with the rupture and with the sudden break from the past, and freedom – the ultimate price of revolution – is never an abstract term, but rather, always freedom from something. Acting in concert with others and as such, experiencing the incalculable abyss of power and with it, releasing the world of human affairs from meaninglessness, even if only temporarily. It was this precisely what happened through resistance in Yemen, after the deadly massacre of Friday of Dignity. “Whoever breaks out here by refusing or resisting has already won, because he or she has regained life from the usual reduction of life in the system. In some cases, this regained life is experienced as absolute freedom. The claims of oppressive society are completely broken, there are no connections to it anymore, no desires or hopes it could meet. The focus is solely on developing the difference to the status quo, to establish a new form of life that has already begun with the simple word No”. “Memory is the foundation of history. Because without it present, past and future would be cut off forever. Historical knowledge is an act of memory. The outward objective event is internalized by memory: man recalls within himself the depths of time. Like a gramophone record he captures all the heights and depths, each forte and piano of world history. History does not just happen objectively in macrocosm, it also comes about in man as microcosm. Subject and object receive their identity from history”. Right there in the crucial moments March 18, 2011 and in between the bullets, the fires, the screams and the bodies that engulfed the whole of Yemen in a thick halo of both grief and promise. The grief contained some of the promise and the promise contained some of the grief. 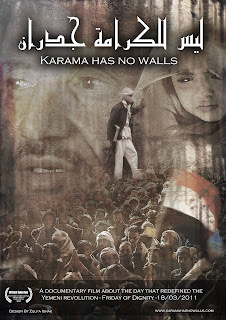 “Karama Has No Walls” works through a series of multi-layered testimonies from two young Yemeni cameramen – Nasr Al-Namir and Khaled Rajeh – whose footage from the massacre is not only shown but they are interviewed as well as commentators of their own stories. The passionate testimonies are not only casual features or footnotes but scalpel incisions into the terrifying images; they succeed in humanizing what if seen on the evening news, would have seemed just one another footage of chaos, tragedy and death elsewhere on earth. In the film you don’t hear the commonplace political commentary after the fashion of journalists but neither are you offered a clean aesthetic version of unrest and death that resembles fiction. What you have before you is an intense storytelling that without harming the personal dignity of the victims, exposes you to the whole truth and I say whole, because it is nothing but a human story – that of a revolution whose actors, and hence, whose victims, were not foreign policy analysts, diplomats and experts but rather, barefoot men, working children and women. The film tells for example the story of Saleem, a young boy who was running some errand for his mother and who as a consequence of a bullet, ended up blinded in both eyes. The story of Saleem – of which there might be hundreds and thousands throughout the entire Middle East – is the story of Arab Spring: Children and young men giving up things that you can give up only once – your life, your sight – for the sake of that something which hasn’t happened yet. Young and blind, the revolution in Yemen continues in spite of the grief of an older generation that has to raise children without eyes and to bury other people’s children. But the fact that there are people without eyes – as in the Greek tragedy – it doesn’t mean that they aren’t seers or that they have no visions. Because the images, stories and testimonies do not follow necessarily a chronological order and aren’t arranged for view through analytical prisms but rather left on their own to tell their own story, I would be doing injustice to the poetics of the film if I called it simply a documentary. Sarah Ishaq’s film is not only a documentary but all of the above – a poem, an essay, a lamentation – and performs what Susan Sontag demanded: “The job of nonfiction films is not so much to develop actions as to represent conditions”. What “Karama Has No Walls” achieves is not simply to highlight one or a few stories among many – although it does that too – but to represent the human condition – containing both the orders of happiness and unhappiness – as seen through the eyes of a few Yemeni stories from their revolution. There’s no greater poetic privilege than that of telling the truth and documentary films are one of the most magical opportunities to do this: Avant-garde filmmaker Maya Deren spoke often in her theoretical essays about the fantasy of film coming from the discipline of the “controlled accident” in which the camera is not only achieving “loyalty” to reality but making a creative use thereof. The stories that “Karama Has No Walls” is telling are all true – and tragic – but they’re more than news items lost in the vast vault of information highways. They’re true in a different level – they set free the forces of memory and create little worlds inside a turbulent present. They offer a point of no return and in doing so they reconcile the grief of the past with the promise of the future.